Using this tool you can scan the RSSI/LQI values for all ZigBee networks in your area (you don't have to join them, just being in range is enough) and log the RSSI/LQI values for a specific network. This is very helpful if you experience connectivity problems with your ZigBee network. Visit the download page for the release notes and downloading a release. Z357PA30-USB-P-NC-N-X: this is the ZigBee HA (HomeAutomation) version. Recommended as future extensions are probably only supported by this type. Z357PA22-USB-P-TC-N-C: this is the ZigBee SE (SmartEnergy) version. The dongles are available from a distributor like Avnet. It runs best using the Google Chrome browser but other modern browsers like Firefox or Opera should work as well. Some people also state that the tool works with the Internet Explorer, but using this browser is not recommended anyway. Download the latest release of the ZigBee Survey Tool (the binaries, not the sources) build, extract it to a location of your choice. Windows users should use a short root path (e.g. "C:\zigbee") as there are issues with Windows Explorer: the length of the folder structure exceeds 255 characters. Install the drivers obtained from MMB Networks webpage for the USB dongle and attach it. If you want to build the tool on your own, you need some additional development tools on your machine in order to compile the native sources. Check TooTallNates node-gyp page for the tools needed for your operating system before runningnpm install. Install libudev-dev before running npm install:sudo apt-get install libudev-dev. The USB dongle does not need a driver for the Raspberry Pi. Connect the Raspberry Pi with the network and connect to the webserver using a tablet or smartphone. See my blog entry for more details. If the environment variable SIMULATOR is set to true, simple simulated data is used. This mode enables debugging the UI without a ZigBee network or hardware. The first page shows all networks in range, updating the list continuously. If you select a network by clicking on its extended PAN-ID, the second page opens with detailed data about the selected network. Use the log field to enter some data (e.g. 'Room 201') and press the button right of the input. This logs the measurement and adds it to the list. After finishing your survey, print the page (generate a PDF) and return to the main page. The other networks are not scanned while analyzing a specific one. PAN ID ('Personal Area Network' ID), a 16 bit long identifier which is unique for each ZigBee channel. Extended PAN ID, the 'MAC-Address' of the ZigBee device. The first few bytes identify the manufacturer of the device. Permit association: flag whether new devices can join a network or not. The software on the USB dongle gets the signal strength of the received beacon response which is displayed then in the tool. 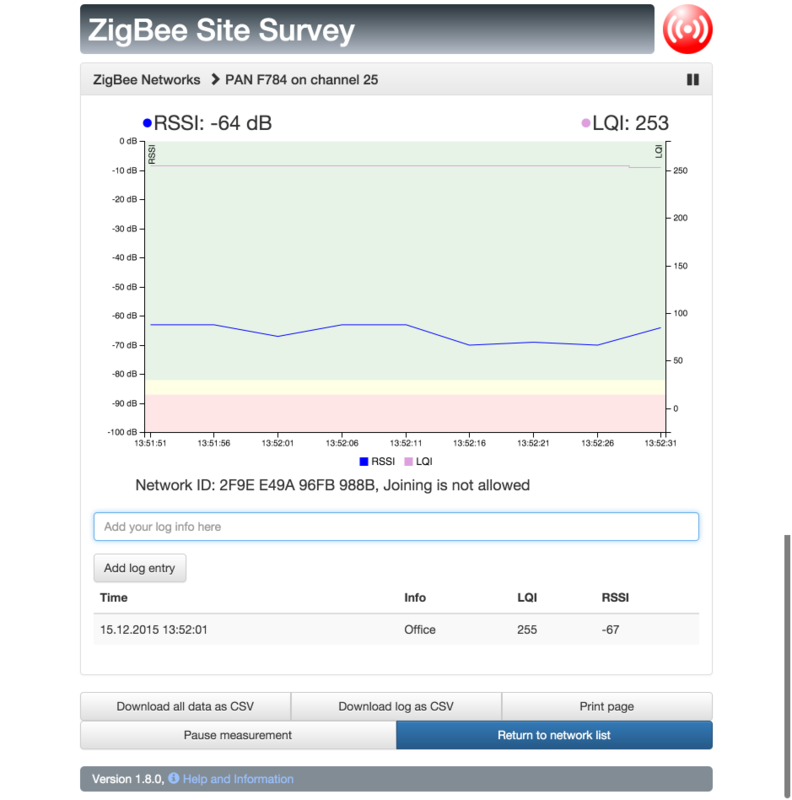 The ZigBee Site Survey tool can be customized with own CSS rules and about dialog. Just follow the instructions in the Customizing ReadMe file. Feel free to add your logo and styles. But if you supply this tool to your customers, please also supply a support hotline for them as I won't be able to spend time for this. Thanks. See settings.js for the options available.